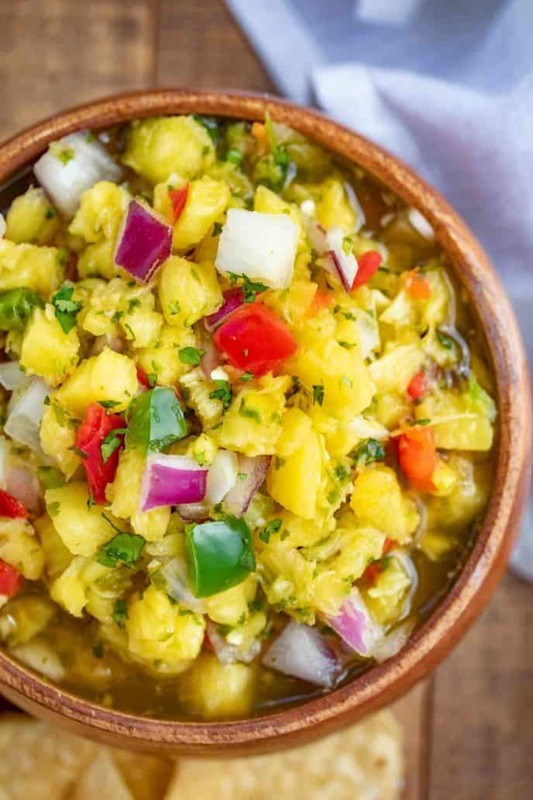 Pineapple Salsa is the perfect topping for the Grilled Chicken and other grilled meats (like my favorite Jerk Chicken) we’ve been enjoying as the weather warms up and the perfect recipe to make with extra pineapple you may have left from making Fruit Salad. 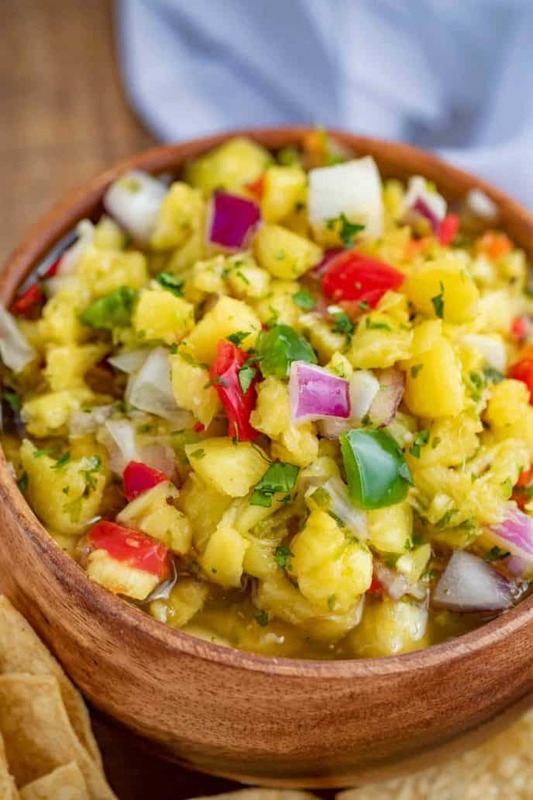 The combination of pineapples, onions and peppers mixed with lime juice, garlic and cilantro creates a quick and easy pineapple salsa to enjoy all summer long! 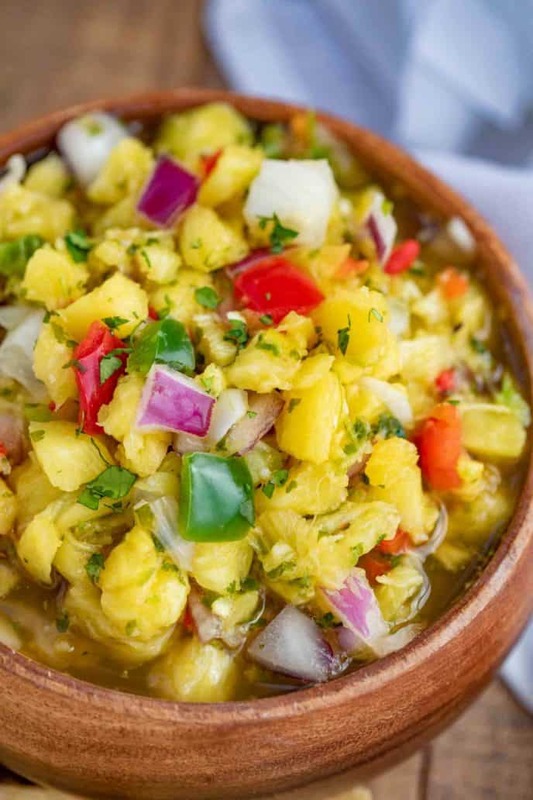 We never run out of ways to use this pineapple salsa recipe! Our favorite pairings for this fruit salsa are with classic Mexican recipes like easy carne asada, carne asada tacos, shrimp tacos, and even crispy fish tacos. Fresh pineapple salsa elevates these dishes to restaurant quality meals with very little effort. You are likely very familiar with classic salsa but did you know that other fruits can be used to make tropical salsas? 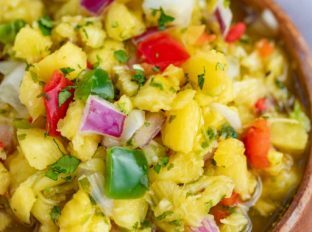 Pineapple is vibrant and flavorful and the perfect ingredient for this easy homemade summer salsa. It’s fresh, healthy, low calorie, fat free, cholesterol free, gluten free, dairy free, and suitable for vegans. Now that is a long list! Yes, this pineapple based topping will delight all of your guests! Prep time is minimal for making salsa. 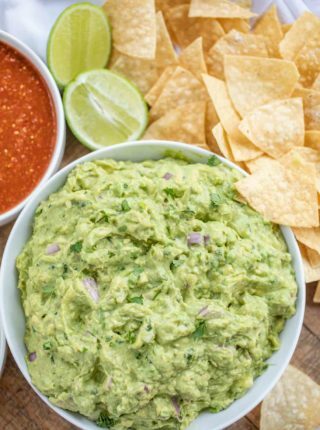 Five minutes is all it takes to prepare the ingredients and then the salsa rests in the refrigerator until it’s time to serve. It couldn’t be any easier! The primary kitchen tool you’ll need is a sharp knife for chopping all of the ingredients. You can buy pineapple spears at the grocery store or whole, fresh pineapples. Chop the ingredients: pineapple, red onion, white onion, red pepper, green pepper, jalapeno, garlic and fresh cilantro. Squeeze the fresh limes then mix all of the ingredients together in a bowl. 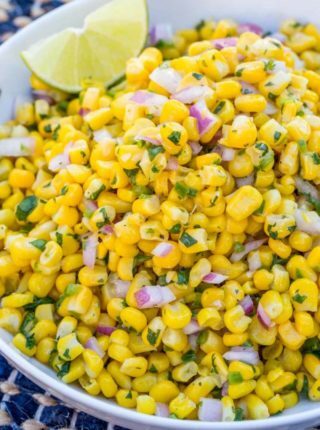 Swap out the diced pineapple for mango and make this easy recipe into a mango salsa! 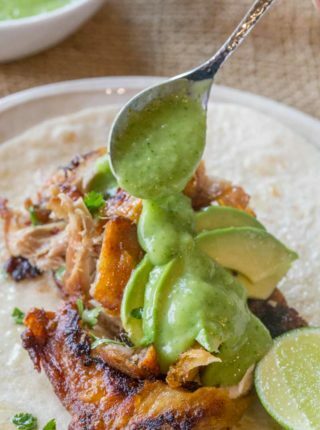 Chicken: Grilled chicken is a natural fit, but any chicken would work including Slow Cooker Rotisserie Chicken. Fish: salmon, tilapia, or cod are easy healthy fish options. Pork: pork chops or pork tenderloin or even pulled pork cooked low and slow. Rice bowls: Serve the pineapple salsa with Spanish rice and fajita vegetables in a rice bowl. Ham: Fresh pineapple salsa is perfect for leftover Easter ham! Eggs: Jazz up your scrambled eggs with a spoonful of salsa. Tortillas: Pineapple salsa is a light and healthy pairing with tortilla chips. Pineapple salsa can be stored in an airtight container in the refrigerator for 5-7 days. You can freeze salsa but it will not look the same once defrosted. The salsa will be watery. You can thaw the salsa then drain it if you wish, although fresh salsa may taste better. Yes, you can use canned pineapple if fresh pineapple isn’t available. Buy either sliced pineapple or pineapple chunks to make canned pineapple salsa recipe. First, drain the can of pineapple (reserve the liquid for another purpose) then chop the pineapple and proceed with the rest of the recipe. If you do used canned pineapple, make sure to use fresh lime juice to punch up the fresh flavors in the recipe. Pineapples are rich in vitamins, enzymes and antioxidants. Pineapples are thought to help digestion, build strong bones, and they contain vitamin C and manganese. What are the side effects of eating pineapple? Although pineapples do have many positive points, sometimes there can be side effects of eating pineapple. Some people have an allergy to pineapples that make their lips or mouth swell or their tongues might be tingly. This can be a reaction to an enzyme in the pineapple. Pineapple has been known to react poorly with certain classes of prescription drugs so do be careful if eating large quantities. Pineapples are highly acidic and can cause teeth damage. Unripe pineapples also are not recommended for consumption and can cause stomach irritation. There is an enzyme in pineapples called bromelain which was been studied and is thought to help in metabolizing protein, which in turn helps to burn fat. We always suggest that you contact your doctor for health and nutrition advice. Switch out the pineapple and use other summer fruits like mango, cantaloupe, or watermelon. Grill the pineapple before chopping or roast it in the oven. Use any combination of peppers– orange, yellow, red and green bell peppers or pump up the heat by leaving the seeds in the jalapeno. You could also use a hotter pepper if you wish. Mix all ingredients together in a large bowl and refrigerate for at least 60 minutes before serving. Pineapple salsa, calling my name! Will be making this all summer long! It’s a winner no matter when you make it! OMGoodness your Pineapple Salsa looks so fresh and lite I could eat some right now with tortilla chips as a late night snack – yum! So perfect for snacking! Enjoy! I’m obsessed with fruit salsas, and pineapple is one of the best, especially with that hit of Jalapeño! This one is right up your alley then! 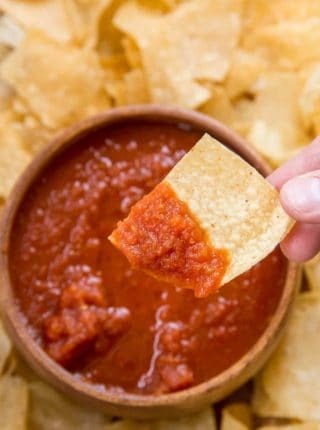 This salsa looks so good! I want to pile it high on a fish taco right this second. Now I’m hungry for fish tacos, haha! Love pineapple, love salsa, so this one just had to be a winner, like all of your recipes! I am so making this! Thank you. This is wonderful. Thank you so much Sabrina for sharing this. My son (54) loves this so. I make it for him when he comes to visit. That’s so sweet of you to make it for him. Glad to hear he loves it.